HD Transparent,99% Color Reproduction: restore the true color, to bring a clear and true navigation user experience,high definition and great durability. Material and Technology: Our products are made of imported glass material with advanced nanotechnology, and laser cutting to fit the device screen for HONDA CRV. When you install the protector,pls put the sucker on the corner of it. WHAT IS THE ADVANTAGE? 9H Hardness Anti Scratch,Oleophobic Coating,Anti-explosion,Anti Fingerprint,Anti Glare,filter UV.Automatic Adsorption. WILL IT AFFECT THE OPERATION? No,0.25MM ULTRA THIN will not affect the sensitivity;HIGH DEFINITION give you a clear and true using experience. WHAT IS THE MATERIAL? Imported glass material with advanced nanotechnology, and laser cutting to fit the original device screen for 2017 HONDA CRV Series. WHAT IS INCLUDED? 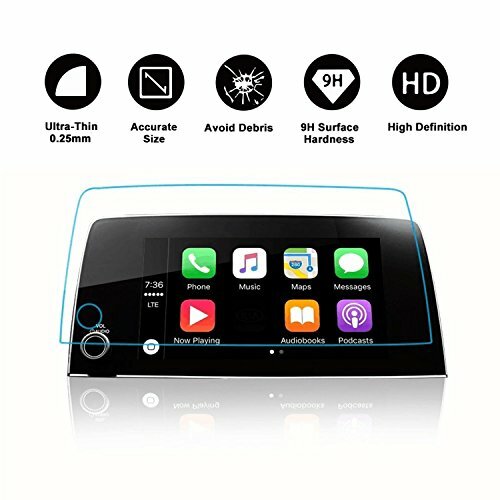 1 X Navigation Screen Protector;1 X Installation Auxiliary Tools (Plastic Sucker,Dust Removal Stickers ,Alcohol Prep Pad, Micro-Fiber Cleaning Cloth), 1 X Gift Package.